Sleeping inside the walls of the Alhambra in Granada was extraordinary. Dipping churros into warm chocolate at Chocolateria San Gines in Madrid was decadent. Standing at the southernmost tip of Europe where the Atlantic and Mediterranean meet was exhilarating. But Seville won our hearts. By a long shot, Seville was unanimously our favorite stay on this trip. It had a lot to do with our lovely Spanish-style apartment in the heart of the Barrio de Santa Cruz. The cozy little neighborhood is the former Jewish quarter of the medieval city and is now the embodiment of all things Andalusian. Narrow alleyways twist and turn through whitewashed villas and tiny cafés, and small shady plazas, or squares, appear regularly in between. One side of the barrio is bordered by the fortified wall of the 12th century Alcázar Palace, another by a large garden, and another opens up to the grand Seville Cathedral. There is no better way to enjoy Seville than to wander the alleys of Santa Cruz. Barrio de Santa Cruz is bordered by the Alcázar's walls. Our two bedroom apartment with air conditioning (a necessity), glass-ceiling eating area, kitchen, and cool Spanish paver flooring was located in an alley no more than three feet wide, steps away from a café where we got to know the waiters by name. Breakfast was included every morning at a restaurant, around the corner, in the Plaza de Doña Elvira. The apartment was a relaxing place to come home to every evening after sightseeing all over the city. The Seville Cathedral is the largest Gothic cathedral in the world and the third largest church in the world. (Guess which two are bigger? Answer at the end of this post.) I love how the cathedral sits in the middle of a very large square with no vendors, restaurants, or shops butting up against it so you can view its full magnificence all at once. We climbed to the top of the Giralda bell tower and could see across the entire red-tile-roofed city of Seville. The Alcázar Palace literally took our breath away. Yes, it was our first full immersion into Moorish splendor so we were impressed, but even now when I compare images of the Alhambra in Granada and Pena Palace in Sintra, which we also visited, the Seville Alcázar is like whip cream on top of the others, so delicate and lovely. The Alcázar gardens rival any other palace gardens I've seen in Europe, with the exception of Versailles. I wish we had days to spend there. 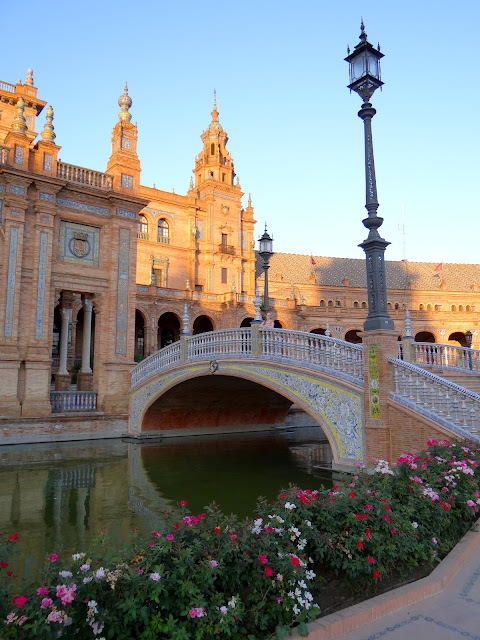 We happened on the Plaza de España at the golden hour, and it was bathed in warm yellow light and empty of people, except a few evening strollers and a bride being photographed. I instantly fell in love with the Renaissance buildings, the romantic curved bridges, the gorgeous little alcoves representing the different provinces of Spain, and the intricate tile work everywhere. I'm usually more partial to old(er) landmarks, but this plaza, built only in 1924 as a World's Fair building, left a staggering impression on me. Plaza de España, above and below. We attended a flamenco show in Seville which tops my daughter's list of favorite memories. A dancer herself, she was mesmerized, as were we, by the emotional intensity and energy of the dancers. The show was fabulous - even my son enjoyed the performance. Seville is a metropolis, and around the train station and outer limits we noticed some graffiti and grit, but most of the area in the center of the city is as charming and embracing as any of my favorite European medieval towns. Our stay in Seville was the highlight of our trip. • There are no grocery stores or even mini-markets anywhere in the Barrio de Santa Cruz nor even nearby. Plan your grocery shopping ahead of time. The nearest market is near the river and Plaza de Jerez. • Free WCs can be found in Starbucks or other restaurants and cafés. • Some websites show the Alcázar Palace closed on Mondays. It is open on Mondays in the summer. Answer: St. Peter's Basilica in Rome and the Basilica of the National Shrine of Our Lady of Aparecida in Brazil are bigger than the Seville Cathedral. This post is part of Photo Friday at DeliciousBaby.com. Absolutely stunning! Looks as tho you were the only people there! Did you see the barber? Beautiful photos - I can definitely see why Seville won your hearts! I would love to visit Spain sometime. Did you find it terribly hot being there in the summer? We're stuck with school vacations which means either Christmas, March or summer which is less than ideal for a lot of places that I want to go. These pictures are gorgeous! No wonder Seville won your hearts among all the other wonderful Iberian cities. What a beautiful city full of interesting places. I love those Alcazar photos. The pictures are beautiful! Seville isn't the first city that comes to mind when I think of Spain, but you definitely make it sound like a "must-do" destination. Although dipping churros in chocolate might sway the table in Madrid's favor. Thanks for one’s marvelous posting! I definitely enjoyed reading it, you can be a great author. I will be sure to bookmark your blog. So now I have the answer, Sonja! Though we've visited Sevilla a few times we've never actually stayed overnight, but I'd like to at some point. Love your photos. Our first visit was just half day on a coach trip and I can remember being gobsmacked by the Plaza de Espana (which has since had some renovation done as it was a bit sad, so your timing was good). We raced around like loonies trying to see everything in the allotted time, and there are still bits unseen. Have to agree about the Real Alcazar- gorgeous. Did you get to Cordoba? If anything I liked the palace gardens there even better. I was a tiny bit disappointed in Granada, though obviously not with the palace itself. Beautiful pictures! The palace really looks majestic. I have always been intrigued by all things Spanish; that maybe the reason I started learning the language. Thanks for the virtual tour!